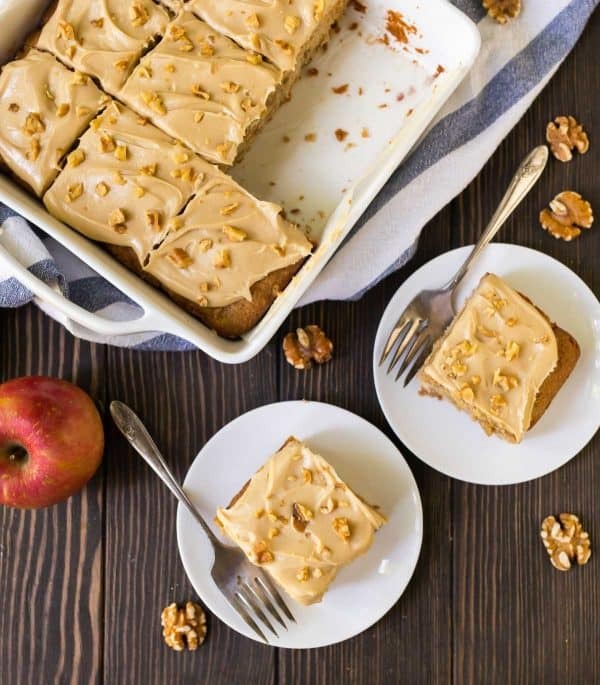 This old-fashioned Fresh Apple Cake recipe is all the bits I cherish about fall—apple picking, chunky sweaters, cinnamon sticks, and crackly orange leaves—turned into a warm hug of a dessert and slathered with dreamy caramel cream cheese frosting. When I think about the perfect fall day, I envision red leaves against icy blue skies, backyard football games, and piping hot mugs of cider. I imagine pink cheeks, fuzzy slippers, and oversized, squashy armchairs. Most importantly, my perfect fall day necessitates a big, warm slice of freshly baked apple something. Something frosted. Or glazed. Or ice creamed. Or frosted AND ice creamed. Fresh Apple Cake with Caramel Cream Cheese Frosting, you are that apple something of my eye! 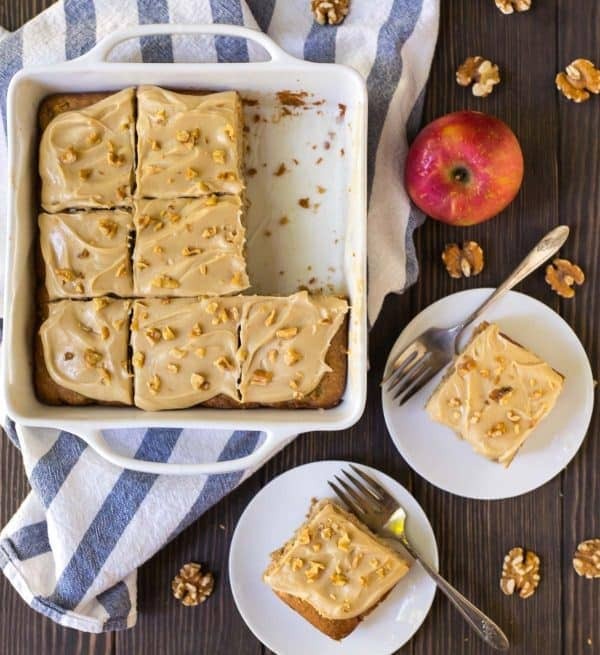 This fresh Apple Cake is a moist, rich spice cake studded with hunks of tart apple and bits of toasted walnuts. It is scented with cinnamon and nutmeg and allspice and is the kind of homey, comforting dessert I imagine myself loving as a kid and baking as a grandma and craving every autumn in between. The apple cake recipe was a bit of a saga to get right, but it was worth every Granny Smith (and GASP honeycrisp!) in the bag. If you follow me on Instagram, you may have witnessed the incident in which the beautiful apple bundt cake I stayed awake until midnight to bake emerged from its pan in 10 odd pieces. As I learned the hard way, this apple cake is so supremely moist and apple packed, it’s better suited for a regular square baking dish than it is a bundt pan. A few adjustments to the recipe later, and I have for you a perfect, more reliable Fresh Apple Cake, scratch-made and ready to be slathered in cream cheese frosting. But not just any cream cheese frosting. CARAMEL cream cheese frosting. 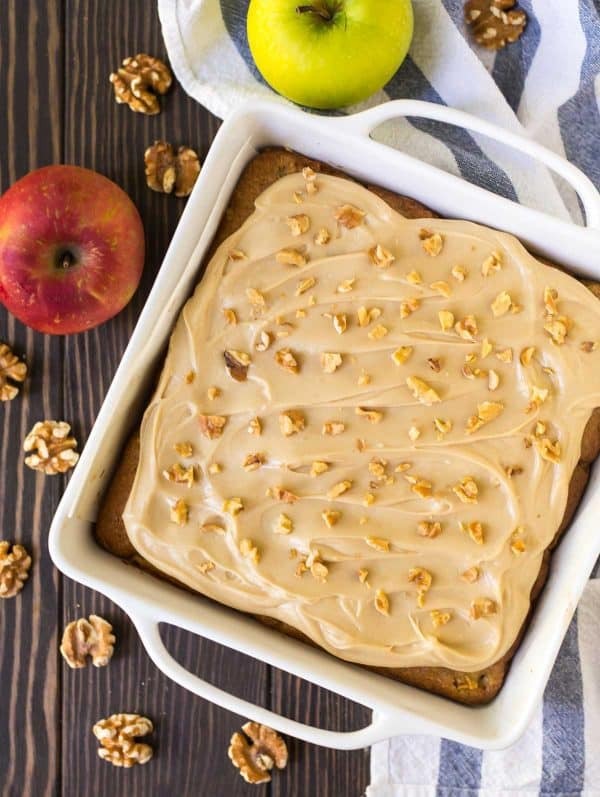 This Fresh Apple Cake is special, and it deserves a special topping to match. The addition of the brown sugar makes the cream cheese frosting taste like caramel, no making of actual caramel required. Translation: it’s quicker and easier, which means you will be eating apple cake sooner than later. YES. Add a shower of toasted walnuts and you have a creamy, crunchy sensation in every bite. Another yummy twist for the next time you bake this cake, as I suspect there will be a next time: Fresh Apple Cake with coconut and pecans (swap pecans for the walnuts and add a sprinkle of both on top). New topping, same warm, happy fall feeling. Every fall, I like to treat myself to at least one indulgent apple dessert. It’s my grown-up way of experiencing the same unabridged autumn bliss I did as a kid diving into a pile of leaves, with fewer bruises. I can attest to this because I tried jumping into what I thought was a large, cushy leaf pile recently. Let’s just say I don’t bounce back the way I once did. 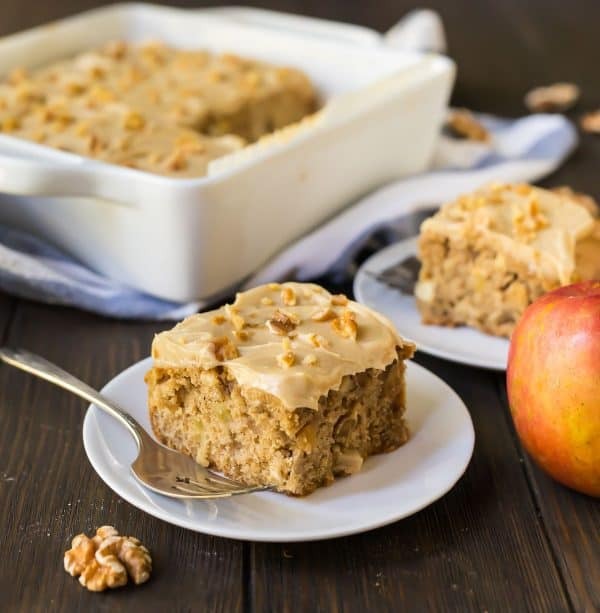 While Vegan Apple Crisp, Hasselback Apples, and baked Apple Chips are a few of my go-to healthy apple treats, this Fresh Apple Cake is extra special. Don’t skip the cream cheese frosting, and be generous with the nuts. 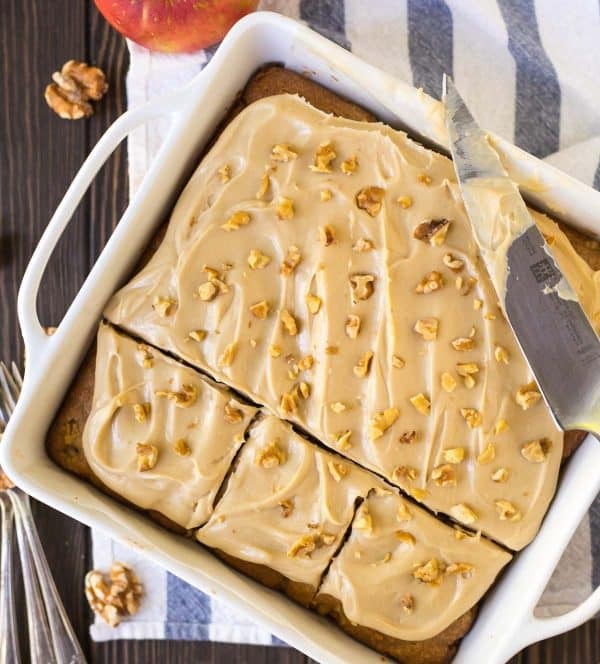 Your inner leaf-jumping kid (and outer apple-dessert-loving adult) will thank you! Pumpkin bars! I follow the Law Student’s wife on pinterest and facebook–love the blog! My favorite fall treat are Lumberjacks-molasses and spice crinkle cookies-‘Good in the spring,too. The kids eat them by the handfuls,me too! I made this apple cake yesterday and I think it might be my new fall favorite! Whooo hooo! So glad you liked it Patti! I’m in the process of baking this cake now! Holy moly I got some of the batter on my finger and had to of course give it a try- SO much flavor I did double the amount of cinnamon but I’m literally licking the bowl, Cannot wait to try this! Jamie, I totally wish I were in your kitchen right now! It must smell amazing. I’m a total cinnamon fiend, so I’m all for putting in extra. Hope you enjoy every bite! oh my gawd, love me some apple cake! and I’ve got to try this brown sugar frosting. . yummmm!!! I meant to write Peter I dont know why it typed Erin . No worries Peter! Your comment made my day, and I’m glad my reply helped :) You have a good morning too! Just wanted to say that I just made this BUT I make cakes for a restaurant and I didn’t have the icing ingredients so I kind of fudged things . I made the cake as is (delicious) but instead of icing I made a mixture of 1/2 c of sugar, 1/2 c of butter and 1/2 c of evap milk and boiled for 2 minutes and poured over top of warm cake – Awesome! (no cider either – used little cup of applesauce) McGuyvering! Carol, I’m so happy to hear that you loved the cake, and your warm icing sounds divine too. Thanks for trying the recipe and letting me know how it turned out for you! Wow. I was still regretting the fact that I never got to eat apple cake in Iceland, but now it looks like there’s no cause for it! I could inhale this cake! Can I use cake flour, in this recipe? Hi Lynn, I haven’t tested the recipe with cake flour, so I can’t vouch for the results. You may need a few additional tablespoons of cake flour, as it’s a much lighter flour than whole wheat or all-purpose. If you do give it a try, I’d love to hear how it goes. Sounds /Looks Yummy! Anxious to try this recipe! OMG, this is the most fall dessert EVER! LOVE it! I made the cake tonight and it is so delicious and moist! The directions are easy to follow too. And the frosting is finger linking good!..I set some to the side so I can dunk apple slices with it. Might make the cake again for Thanksgiving. Thx for sharing! Dunking apple slices is a genius idea, Alexis! I’m so happy to hear you enjoyed the cake. Thanks so much for reporting back! I tried making this cake today and even after an hour in the oven, the top was still very pale and the middle was not cooked. Does the temperature stay at 325 for both toasting the walnuts and baking the cake? I’m positive it’s not an issue with my oven. Thank you! Hi Liza, 325 is the correct temperature. The longer bake time probably was the result of the moisture content of your apples. I hope you were still about to enjoy the cake! Please, please let me know! Thank you! Hi Tascila, I have not tested the recipe with gluten free flour, but if you want to experiment, I think a 1:1 GF flour blend may work. If you do decide to experiment, I’d love to hear how it goes! This looks yummy,what should be the quantity if substitute all purpose flour? Hi! You can use the same amount of all-purpose flour. I hope you enjoy! How would you tweak recipe to use a 9 x 13 pan and have more servings? Hi Sue, I haven’t tried it myself, but I would double it for a 9×13. I hope you enjoy! Thank you, Erin, for this delicious cake recipe! I used Granny Smith apples, chopped pecans instead of walnuts, and plain whole milk yogurt instead of Greek yogurt but it was still mighty moist and tasty 🤤 Served it for company this evening and it was a hit! Such a genius dessert, it has fall written all over it! Emily, I’m so happy to hear the cake was a winner! Thanks so much for taking the time to leave this wonderful review.